Absolutely beautiful!! One of the nicest places weve stayed! Thanks for the hospitality! The property is gorgeous! Plenty of things to do without ever leaving the building! Awesome condo! Beautiful, clean condo. We would highly recommend. Beautifully renovated!!! Our off season visit was wonderful!! The beach was great!! The indoor pool warms the water to the outdoor pool. Our grandsons loved that!!!! Easy access to everything youd want in the area. The condo is modern and clean, with good decor and comfy beds. We loved the large balcony with the 14th floor views. My husband and I have vacationed in Gulf Shores/Orange Beach many times. We really enjoyed our stay at the Royal Palms. Everything was very clean, the technology is relatively up to date with smart TVs and decent Wifi. The view from the balcony was gorgeous! The next time we're looking to book a place to stay, I would not hesitate to book here again. Where to start to tell about this beautiful condo? It is a three bedroom, three full bath unit. There is no way to make three ladies happier than to give them each their own bed and bath. However, that is not what made this place so special. The unit was spotless..shined like a new penny. Very important. It was beautifully decorated. Someone with an exceptional eye for decorating had a hand in making this condo stand out. The furnishings were very comfortable and plentiful. The kitchen had an abundance of glassware, dishes, and gadgets to make any cook happy if that is what you choose to do on your vacation. The outdoor area was outstanding. Great view of the gulf/beach and the outdoor furniture was really a hit with us. Plenty of seating and comfortable. Nothing was overlooked that could have possibly made our stay more enjoyable. And last, but not least....a touch that really set the tone for our stay. We arrived to find welcoming lights had been left on for us. Way better than Motel 6! The unit was beautiful and perfect for two families. The view was breathtaking from many places in the unit and the amenities were amazing. Hope to be back soon. 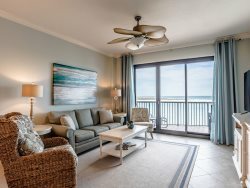 Majestic Gulf-front stay Large, clean, tasteful, and well appointed accommodations right on the gulf. Close to everything. We enjoyed our stay. Clean and convenient to shopping and restaurants. We spend several weeks a year in OB. This was our first time staying at Grand Point and we really enjoyed it. The location is great, the condo was clean with every thing we needed. Would definitely stay here again! What a beautiful condo! Clean, beautiful decor and great location. I would definitely recommend this condo to anyone traveling to the Orange Beach/Gulf Shores area. This property was just as I expected it to be. It served us very well. There was a lot of space in the unit. It had a beautiful patio with a lot of furniture. Beautifully decorated throughout. Very comfortable beds. There were 3 elevators and we never had to wait for one. Plenty of parking. We had a wonderful time and really enjoyed this resort! This condo is amazing! The furniture and beds are super comfortable. The unit has been well maintained. We had everything we needed. The view was also amazing and you can't beat the location or amenities of the property. Overall this was the perfect stay. The furniture and decor have been updated since the photos online. Its was very beachy and has comfortable furniture. Would definitely stay at this unit in the future. The condo was so nice. A few little hiccups but staff was very friendly and helpful. My wife and I really enjoyed our stay at this condo and Gulf Shores. The condo was very clean and had all the things we could possibly need. The view from the 11th floor was wonderful. The location was great as you had access to many restaurants and local businesses. Would love to stay there again but for a month instead of two weeks. This was a girls getaway extended weekend for four of us. We loved this condo! Everything we needed was there. The wrap around balcony with sliding doors in every bedroom was fantastic. Very nicely decorated. Access to the beach, hot tubs and other amenities was smooth. Would definitely stay here again. We love the Orange Beach area because it is less commercial and congested. This was a wonderful property for our mid-winter get-away - well maintained, clean, spacious and perfect location with the beach only steps away. Truly an unforgettable stay! Color coordinated and spotlessly clean! Beautiful views! Nice, quiet beach! It would be most helpful for guest to have a pantry area and for a few basic seasonings, salt and pepper, to be furnished. Clearwater 8B was clean and comfortable. The furnishings are well done. Good location.